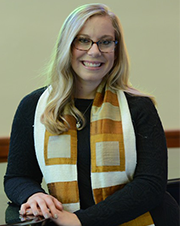 Cantor Andrea Rae Markowicz is the Senior Cantor of Am Shalom in Glencoe, Illinois. Ordained from Hebrew Union College-Jewish Institute of Religion (HUC-JIR) Debbie Friedman School of Sacred Music, she has an extensive background in secular and liturgical music, as well as Jewish and Israel education. She holds a Master of Sacred Music from HUC-JIR, a Master of Music from The Cleveland Institute of Music and a Bachelor of Music from University of Michigan, both in Voice Performance. Cantor Markowicz is a proud member of the American Conference of Cantors (ACC), Reform Cantors of Chicago (past president), Actors Equity Association (AEA), and the American Guild of Musical Artists (AGMA). 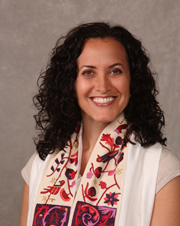 Cantor Julie Staple is excited to be the first associate cantor of Am Shalom. Ordained in the spring of 2018 from Hebrew Union College-Jewish Institute of Religion (HUC-JIR) Debbie Friedman School of Sacred Music in New York, Cantor Staple holds a Master of Sacred Music from HUC-JIR, a Bachelor of Arts in Jewish Studies with minors in Music and Folklore/Ethnomusicology from Indiana University. 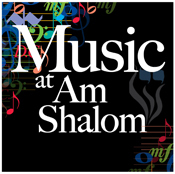 Ken Smith (Piano/Organ), has been pianist and organist at Am Shalom since 1982. A native of Louisiana, Ken received his Bachelor of Music and Master of Music degrees in piano from Indiana University, studying with Sidney Foster. In 1992, Ken joined the faculty of the Bienen School of Music at Northwestern University as a vocal coach, retiring in June 2014. Since 1987, he has been an accompanist for the Metropolitan Opera Auditions in the Central Midwest Region. He is a frequent lecturer on German Lied, focusing primarily on the works of Hugo Wolf. Noah Plotkin (Musical Artist-in-Residence) is the Founder and Music Director of Life Rhythms Inc. Raised in Highland Park, Noah is a Drummer/World Percussionist, and a graduate of Berklee College of Music. He has collaborated as a percussionist with The Martha Graham Dance Conservatory in NYC, Sala Crisantempo School of Dance in Sao Paulo, Brazil, The Amsterdam Theatre School of Dance, Lou Conte Chicago and Northwestern University School of Dance. Noah is currently a private drum set/percussion teacher for students and families, music educator and valued member of many different Chicago area world music, rock, blues, funk, pop and jazz ensembles including Chicago's elite wedding band The Gold Coast All Stars. Noah believes music is a universal language that reaches across all cultural and demographic boundaries.